To determine if climate and nutrient enrichment have an interactive effect on herbivory in mangrove forests, and how the strength of the interactions varies by latitude. Global warming and eutrophication are major threats to coastal environments worldwide. Because of differences between temperate and tropical ecosystems in nutrient availability and cycling, nitrogen/phosphorus coupling and carbon retention, ecosystems in the tropics are predicted to have stronger responses to nutrient enrichment, greater diversity, and more intense biotic interactions than in temperate areas. Mangrove forests, which occur across a broad biogeographic range from warm temperate to tropical, provide a unique opportunity to test these hypotheses by investigating the responses of herbivores to nutrient enrichment in temperate vs. tropical latitudes. We are using fertilization experiments across >20º of latitude in the Atlantic-East Pacific (Florida, Belize, Panama) and in the Indo-West Pacific (Australia, New Zealand) to determine how climate and increased nutrients affect growth, herbivory and diversity of herbivores. In these experiments, we fertilized individual trees with small doses of nitrogen or phosphorus and compared their responses to unfertilized control trees. In the Atlantic-East Pacific, enrichment with nitrogen and phosphorus increased the growth of Rhizophora mangle, the red mangrove, and altered its leaf traits and nutrient dynamics. However, increased nutrients had little effect on foliage-feeding herbivores (folivores). Herbivory was highest at the most temperate location and lowest at the intermediate location. The mangrove tree crab, Aratus pisonii, was the dominant folivore on the red mangrove at all sites. Herbivory correlated significantly with crab density with the highest densities at our sites in Florida compared to Belize and Panama. 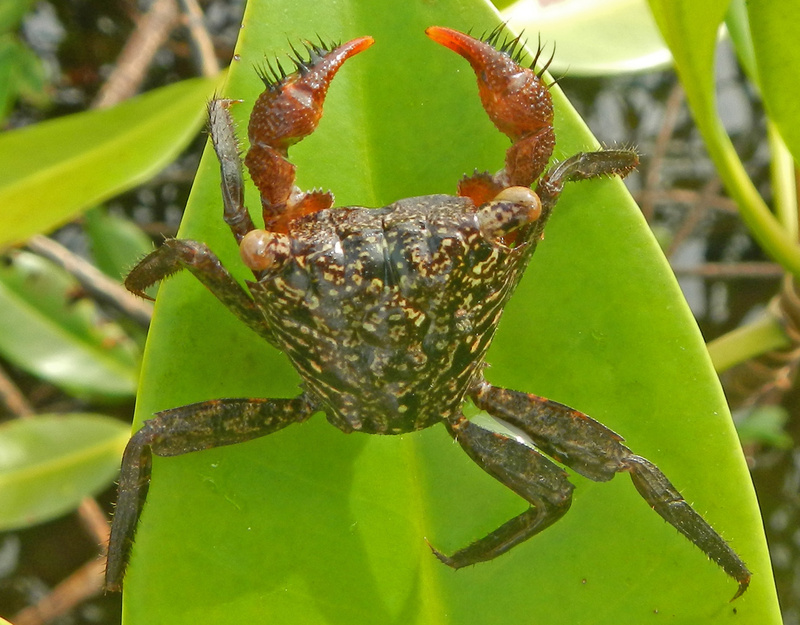 These data suggest that factors controlling population dynamics of the mangrove tree crab cascade to the mangrove canopy, linking herbivory to crab densities. In the Indo-West Pacific, enrichment with nitrogen also increased the growth of Avicennia marina, the grey mangrove. The effect size of the nutrient treatment varied by feeding guild and latitude. Herbivory by folivores varied among the temperate, subtropical, and tropical locations, with differences in leaf nutrient content, latitude, and rainfall accounting for >56% of the variation. Species richness of leaf miners and leaf gallers was correlated with latitude, with more species in subtropical and tropical latitudes than in temperate latitudes. The abundance of galls and mines also differed by location, but differences were not correlated with latitude. Results indicate that climate and nutrient enrichment may have an interactive effect on herbivory of the grey mangrove, with the caveat that the strength of the interactions varies by latitude and is not the same for all herbivores.